Democrats, please don’t mess this one up! The Georgia governor’s race presents a golden opportunity and a profound moment of truth for Democrats across the country. With House minority leader Stacey Abrams’s recent announcement that she’s formed an exploratory committee for the 2018 election, progressives can either capitalize on the country’s population trends and maximize their prospects for victory, or they can once again form a circular firing squad, lose the election, and block progress towards overcoming centuries of racial exclusion. It’s no accident that Barack Obama’s historic candidacy inspired record high turnout among African-American voters, propelling him into the White House by a near-landslide margin. In Georgia, Obama received 47 percent of the vote in 2008, a higher percentage than any Democratic presidential candidate since native son Jimmy Carter’s 1980 campaign (Bill Clinton won Georgia in 1992, but he received only 43.5 percent of the vote in a race where third-party candidate Ross Perot siphoned off significant Republican support). Abrams is poised to ride the same sort of wave that carried Obama to victory. In the 241-year history of the United States, there has never been an African-American woman elected governor of a state—any state. As one of the highest-ranking Democrats in Georgia, Abrams represents the best opportunity to finally smash that glass ceiling. A majority of all voters in the Democratic primary will be black, making her the odds-on favorite to win the nomination. In a state that is rapidly approaching “majority-minority” status (whites currently comprise 53.9 percent of the population), the electoral calculus for Democrats is increasingly favorable. Democrats in Georgia have a vote gap of just under 250,000 votes (in every statewide election since 2008, the average margin of defeat was 236,429 votes). The key to overcoming that gap is mobilizing more of the 1.3 million voters of color in Georgia who have not been motivated to vote. A catalytic, galvanizing, history-making campaign can change that. 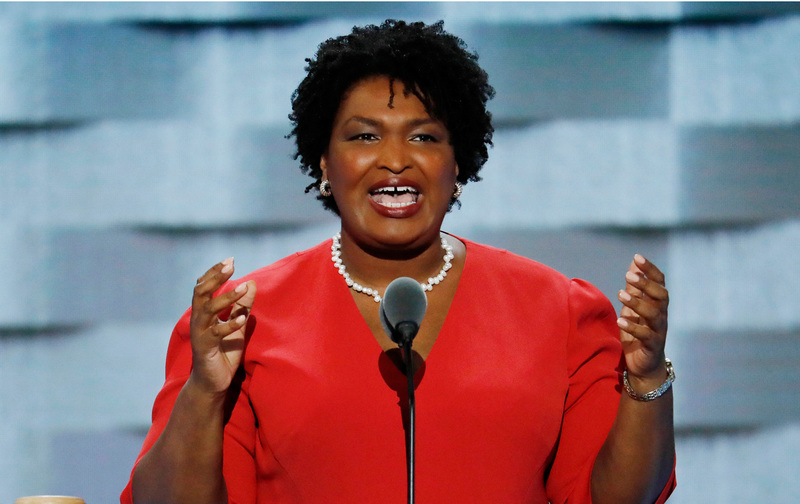 While some bemoan the supposed lack of a Democratic bench, Abrams is already emerging as a rising star in national politics. She spoke at the Democratic Convention in 2016, was featured by The New York Times as one of “14 Young Democrats to Watch,” and has raised millions of dollars across the country to register 200,000 African-American voters in Martin Luther King Jr.’s home state. Winning the top office in Georgia will be critical to retaking political power in the country as a whole over the next several years. Having a Democrat in control of the state’s political infrastructure can ensure everything possible will be done to eliminate the barriers to full political participation that the state’s conservative leaders have erected and maintained since the days of the civil-rights movement in the 1960s. Looking ahead to redistricting in 2021, whoever is governor of Georgia will play a significant role in either ending or perpetuating the gerrymandering that has unnaturally skewed the congressional districts. Fairly drawn congressional districts can put in play more seats for Democrats to recapture control of the House of Representatives in 2022, if that hasn’t occurred beforehand. But will the progressive community rally to the cause by removing any unnecessary obstructions in Abrams’s way and making her candidacy into a strategic national crusade? Sadly, the build-up to this race brings into sharp relief some of the reasons why America has never elected an African-American woman governor. An Atlanta Journal-Constitution article reported that the rationale for getting behind Evans is that she could perform better with white voters. That approach, however, was tried—and failed—in the last midterm election. In 2014, the Democratic nominees for governor and senator had two of the most famous last names in Georgia politics—Carter and Nunn. Jimmy Carter’s grandson Jason was the gubernatorial standard-bearer, and former Georgia Senator Sam Nunn’s daughter Michelle Nunn ran for the Senate. They both lost by slightly more than 200,000 votes, receiving the standard 23 percent of the white vote that Democratic candidates in Georgia have received since 2008. Why would lesser-known candidates from less-beloved families do better? There is simply no empirical evidence that a Georgia Democrat can do much better than 23 percent of the white vote. The greatest upside and clearest path to victory in that state lies in expanding the number of voters of color—the most Democratic voters of all.